The biggest Facebook pages in the world, brand wise, have not changed in the past 2 years. They are Facebook, Youtube, and Coca-Cola. In that order. But that is only if you count their global number of Facebook Likes. Ever wonder how many of those Facebook fans for Starbucks or Coca-cola are in the US? Or Germany? Or South Korea? Well, you are in luck. Socialbakers, a social media analytics company, is launching a new tool called Facebook Local Page Ranks. Breaking out Facebook fan numbers by country is useful for brands looking to get some competitive intel on a more granular level. The Local Rankings reveals some interesting numbers that can teach us both about Facebook and he brands that use it. For instance, only 20% of Coca-Cola’s Facebook fans are based in the US, while 94% of Walmart’s Facebook fans are in the US. Because of this, Walmart, despite having fewer Facebook fans than Coca-Cola (26m compared to Coke’s 57m) has more US Facebook fans. The above chart lays out the top 10 brands by US Facebook fans. 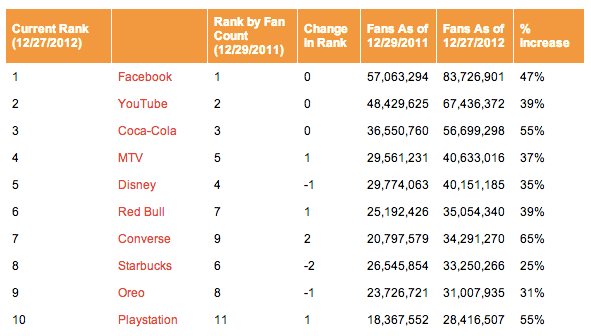 To give you a little context, here is a chart of the top 10 brands by total Facebook fans from Ignite Social Media. This chart compares the 2011 and 2012 numbers for the top Liked brand pages on Facebook.